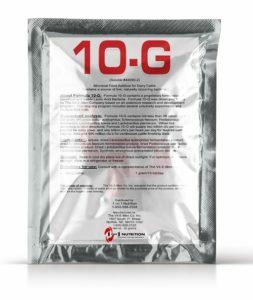 10-G is a unique blend of 5 specifically selected beneficial bacteria fed to cattle at all stages of life. The specifically selected blend in 10-G provides a diverse population which has several modes of action. This results in a healthier, more productive animal at a very minimal cost and adds dollars to your bottom line. The bacteria in 10-G attach to the lumen of the intestine, thereby improving health, reducing digestive problems resulting in better overall growth and performance. Research has shown that certain strains of bacteria can produce antibacterial agents that can kill pathogenic bacteria. Digestion- Between 5% – 20% of total digestibility occurs in the large intestine. Helping provide a better environment with less microbial imbalance, and allowing maximum digestion of feed stuffs. Cattle that feel better eat more and as a result have improved energy status. Greater consumption means better gains and higher production. 5 Research shows lower mortality and morbidity with 10-G. This has a very significant impact on your bottom line. When you feed Life Products 10-G to your dairy cows, beneficial bacteria in 10-G pass through the rumen and attach to the lumen of the intestines. Once attached to the intestines, these beneficial bacteria competitively exclude pathogenic bacteria such as Clostridia, E. coli, and Salmonella. Because of this competitive inhibition, a smaller load of pathogenic bacteria inhabit the lower gut, resulting in a healthier and more productive cow. Increased energy intake. Healthier cows have bigger appetites and a steady state beneficial microflora in the lower gut means less digestive upsets. As a result, feed intake and/or feed efficiency is improved. This concept has been demonstrated in every university research trial with 10-G. More milk and/or milk components. When you feed 10-G, the net effect is that the cow processes more metabolizable energy per unit time. Because more energy is made available to the udder, more energy is recovered in the milk per unit time. That is, either greater milk production and/or greater concentration of milk components. Lower somatic cell count. Cows fed 10-G are healthier, and healthier cows have stronger immune systems. As a result, sub-acute infections are less. Several producers feeding 10-G report a lowered somatic cell count in their herd. Better rebreeding performance. Healthier cows with bigger energy intakepartition more energy to reproduction. When feeding 10-G, expect fewerdays in milk to first estrus and less breedings per conception. Reduced culling. When feeding 10-G, expect improved overall herd health,improved rebreeding performance, and less digestive upsets. The net effect is reduced herd turnover.